We’ve all heard it “Did you see the girl who made an act out of climbing the drapes?” or what about “I could do that, I’m going to go home and practice on my curtains”. Oh my. The jokes. So witty. Pure hilarity. What’s not hilarious is people who grab some material from the local fabric store, which they then hang in their studio / garage / backyard tree to train on. Because why? Well umm… how strong is that thing you are hanging from? Strong enough you say? How strong is that? How do you know for sure? When rigging in any industry, the gear used (slings, beiners, shackles, pulleys etc) will have a stamp or tag telling you how strong it is. The testing of the strength is done by the manufacturer in compliance with Australian standards. In some cases custom built gear such as an aerial hoop or trapeze may not have a tag or stamp. Though it will usually be made from components such as steel cables which are themselves stamped and rated. Or it might have accompanying paperwork from the engineer who designed it. Tissu fabrics are another beast entirely. There is no fabric company that produces this type of material specifically for weight bearing. Although still very strong, when compared to other equipment tissu’s are the weakest and most fragile piece of aerial gear you will find in a circus space. 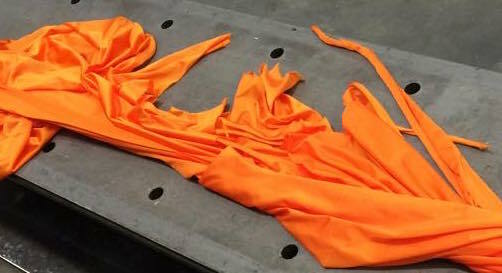 Without getting into a long conversation about safe working loads, shock loading, and appropriate safety factors (lets save that for another post); a single strand of issu fabric should break at no less than 10kN* (10 kN roughly equals 1tonne). * There is another discussion around the appropriateness of this strength – A large drop can generate the force of 4 times the weight of the performer. We’re talking up to 400kg! So how do I know my fabric is strong enough to take the force?? First of all we want to buy fabric from a known supplier. As I mentioned before we cannot buy a fabric specifically designed for weight bearing. But lets start by buying a product that has been constructed with some consistency. And not stored in a way that would have caused the fabric to degrade before you’ve purchased it. i.e. don’t buy from Spotlight. Secondly, we need to test the fabric for strength. This is something that you should arrange to have done every time you buy a new roll of fabric, regardless of where you’ve purchased it. Even if you’ve bought that type of fabric before, you can’t be sure that the manufacturing process hasn’t changed, thus altering the strength. I have purchased fabrics in the past that when tested broke at over 11kN. A few months later the same fabric purchased from the same supplier broke at 4.5kN. Far too weak for any aerialist. I’ve also found that different colours of the same type of fabric can have vastly different breaking strains. How do I test the strength? Cut off a 2m length of your fabric and take it to a NATA accredited load tester. The tester will take this fabric and attach it to a machine that will pull it until it starts to tear. The machine records what pressure it tore at. Simple! Once the tests are done, the testing company will provide you with a certificate detailing the test and the breaking load. It’s important to keep this for your records so you have a reference if you are ever questioned about your fabrics. It’s pretty cool to watch being done, who doesn’t like breaking things? If you can’t afford the cost of testing your fabric, you can’t afford to be buying fabric in the first place. Ideally, if you are buying your fabric from a circus supplier, they should arrange for testing themselves. Make sure to ask them to give you a copy of the test certificate so you know that you’ve purchased the tough stuff – you should have a copy of the certificate for legal and insurance reasons anyway. As I mentioned earlier, there isn’t an official body that regulates standards for circus equipment. So even when your supplier tells you that this fabric can support more than 2200lb. or 1000kg, you should verify it yourself. There’s nothing to stop the supplier doing one test on their blue fabric back in 2009, and continuing to declare that it’s still just as strong. When I was working in telco rigging services, there was a rule of thumb that all our gear should be strong enough to accommodate the heaviest thing we could expect to rig. Although this probably isn’t practical or cost effective, I think its a fantastic principle to go by (especially when it comes to small scale circus). That fabric you are holding onto may be only used by a 20kg child today, but the chance that a 85kg adult might climb it and do a large drop before you have a chance to remind them that it’s the ‘kiddie tissu’. Take that useless, low-testing fabric and make yourself a nice gear bag out of it. Better still, use it to replace your curtains at home. And don’t climb them. Where to get the testing done? Below is a list of some places you can go to get your fabric tested. If none of them are in your area, do a quick google search for “lifting suppliers”, which incidentally should give you a list of where you can buy shackles, slings, chain and all that exciting rigging equipment. Do you test for abrasion on your textiles? Maybe not an obvious problem, but if performers have any ‘bling’ on their costumes it could become an issue. I come from a textile/equestrian background and while a different situation, I have seen unsuitable textiles break and cause accidents.